"Fuel Economy" engine oil is specially designed for recent engines, powered by turbo diesel direct injection or gasoline engines that are designed to use low friction and low HTHS (High Temperature High Shear) viscosity oil. It is suitable for new technology engines powered with turbo diesel or gasoline engines and catalytic converters, requiring fuel economy lubricants (ACEA A1/B1 or A5/B5 standards). These oils may be unsuitable for use in some engines. Refer to the owner manual or handbook if in doubt. This 100 precent synthetic engine oil has been formulated, developed and tested according to the most recent technical requirements of petrol and diesel engines. The new performance ACEA A5/B5 requests fuel economy and low emission performance for powerful engines. 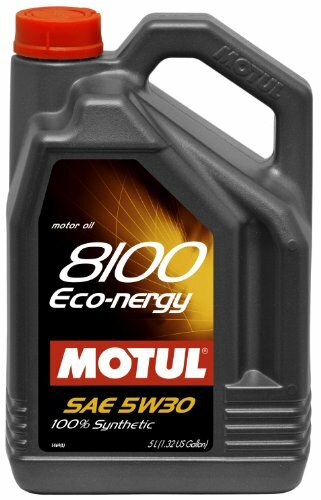 Motul 8100 Eco-nergy 5W-30 has synthetic base stocks and specific friction modifier molecules that provide an outstanding oil film resistance, reducing friction in the engine, maintaining the oil pressure, and generally decreasing the operating temperature. It provides outstanding lubricating properties such as wear and high temperature resistance and controlled oil consumption. Comes with anti-oxydation, anti-wear, anti-corrosion and anti-foam properties.